Consumers of all ages are increasingly turning to the Internet for help with managing their finances, but knowing where to go online for reliable, practical money tips can be challenging. That's why the Federal Deposit Insurance Corporation offers resources for consumers on subjects ranging from deposit insurance to shopping for a bank account and avoiding financial fraud. The FDIC’s Electronic Deposit Insurance Estimator (EDIE) is an interactive tool created to help consumers determine if their accounts at FDIC-insured institutions are fully insured. As an FDIC-insured institution, your qualifying deposits with Central Valley Community Bank are insured by the federal government, as long as the coverage limits and requirements are met. To save you time, have a list of your deposit accounts and the amount you have in each account. If you have joint accounts, or trust accounts that name beneficiaries, have those names available. To check business accounts, you will need the business name and Employer Identification Number (EIN). Mutual funds, Stocks, Bonds, Annuities and ANY investment that is not a deposit. NOTE: If the accounts entered into the EDIE are not deposits in an FDIC-insured bank, the coverage information provided in the EDIE report does not apply. When you need funds fast, count on us to pull you through. 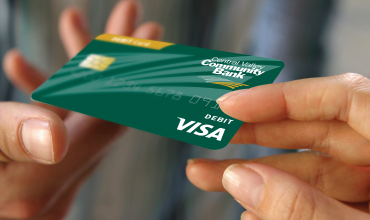 From convenience to security, we have the personal checking account for you.